"Training people to row well, and achieve their fitness goals." The 2k Ergo Test – Our Biggest Adversary? Since taking up the sport in 2014 I’ve rowed 27 2k’s for time on the Concept2 ergo (yes, I counted). The majority of these have been under test conditions as part of crew selection. 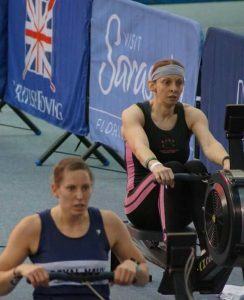 Two have been rowed at the British Rowing Indoor Championships, securing a gold and silver medal in the process. Over time I have improved my ability to effectively pace the piece and through disciplined training have gradually brought down my personal best to a pretty respectable time close to the 7 minute barrier. There is no question that physically and technically I’ve got better at the 2k ergo test. There is certainly nothing peculiar about this as I’m sure all rowers will testify. This sport rewards hard work. The long hours on the ergo, in the gym and on the water pay dividends. It is the same for me as for my crewmates, and as for athletes at rowing clubs and gyms up and down the country. Despite all of this what remains a constant is the feeling of dread that haunts my waking thoughts and has the power to invade my dreams in the days leading up to a 2k test. Added to this is the gut wrenching feeling as I sit on the ergo in the closing minutes of warm up before taking that first stroke. Why should this be? I’m an experienced rower who has sat on a Henley Women’s Regatta start line on the final Sunday. I have a tried and tested pacing strategy. I’ve taken this test and many others like it numerous times. I’m as physically prepared as I can be. What power does the 2k test hold to invoke such mental turmoil? Is it simply the pain? As a means of comparison our squad is regularly tested over longer distances – 5k, 10k, 30 minutes. When pushing to our limit these are all exhausting. They all hurt. Yet none of them cause me sleepless nights. One could argue that the 2k test makes a more significant toll on the body than those others. It does, after all, demand a sustained maximal effort. A former coach analogized that the 2k was akin to holding your hand in a flame and being prepared to keep it there. So is that the answer? Quite simply that the anticipation of what you are about to do – the physical demand that must be endured – that causes such mental turmoil in the lead up to that test. While I have no doubt that this plays a major part I suspect there is also something more psychological at play. Maybe it is the importance that rowers tend to attach to the result of their 2k test. This could come either from an individual perspective (wanting to record a PB or break through a significant milestone) a competitive one (wanting to beat our peers), or a belief that a seat in a particular boat is almost entirely dependent on the outcome. Even non on-water rowers well understand that this is the physical benchmark that rowers use to judge themselves and others against, so I highly doubt they are immune from the psychological trauma. While there is no doubt that 2k results are important, I’ve never known a coach who bases their selection decisions purely on 2k ergo scores. To do so would be naive. I’ve heard from a reliable source that not one of the 2k scores from the Netherlands men’s eight at the 1996 Olympic regatta would have secured a seat in the United States boat at that same event. The United States placed 5th. The Netherlands crew took home gold! Those longer distance benchmarks mentioned above also play an important part in crew selection, but ultimately it comes down to our ability to move a boat on the water. Observations over time and perhaps isolated seat race outcomes will likely figure more significantly in a coaches mind when they put a crew together. The score may be the measure to split two similar athletes competing for the same seat, but that’s really where it ends. Perhaps it is something less tangible. The ergo can be an isolating, lonely place. There are no crewmates around us for support. There is also nothing to look at but the numbers flicking about on the screen in front of us, and those numbers can speak to us in mysterious ways; taunting, goading, providing us the means to doubt ourselves. We may have trained hard for months but within the space of a handful of strokes the ergo can convince us we are not as fit or as strong as we believed. I have seen people stop on the 2k with only 100 metres to go so much had their mental fortitude been whittled down to breaking point. The same athlete wouldn’t dream of doing so on the water in a race with their crew around them. So then, I arrive at a rather unsatisfactory conclusion, that it is likely a combination of all these things that causes such mental discombobulation in the lead-up to the 2k test. To narrow the feeling down to just the physical overlooks the important psychological aspect. As a consequence of this one can understand why the 2k ergo is such a good test. I propose that the difference between two athletes of similar fitness level and physiological make-up is therefore one of mental strength, and it is exactly that which is ultimately being tested. Do you agree or disagree with my thoughts? Are you one of the lucky few who don’t suffer from pre-2k nerves? Is the 2k mentally harder for on-water rowers when they are competing for crew seats? I’d love to hear your thoughts on the matter. As the dust settles on the 2017 British Rowing Indoor Championships it is time to reflect on another fantastic event. With 2,100 athletes competing across 72 races, cheered on by 1,500 spectators in the stands of the Olympic velodrome, BRIC 2017 was the biggest indoor rowing event ever held in this country. A number of competitors traveled significant distances to race – many flying in from Europe, some from as far as the United States. As usual there was a brilliantly egalitarian mix of on-water rowers, gym rowers and cross-fitters competing shoulder-to-shoulder on the race floor. Perhaps one could attribute some of interest that saw spectator tickets sell out in advance to the participation of Bradley Wiggins in his debut rowing competition, but I like to think that it was more a reflection of the continuing growth of the sport of indoor rowing. Credit must go to British Rowing for their organisation and running of a slick and professional event, and their ongoing support for indoor rowing. The Men’s Open category was doubtless one of the main attractions of this years championships. Could Bradley Wiggins, after only 9 months of training, compete with the elite British rowers? There had been much speculation before the event regarding the sort of time we could expect from Britain’s most decorated Olympian over the 2km distance. His coach and mentor, James Cracknell, had teased us with a prediction around the 6 minute mark – not a winning time, but an incredibly competitive one for someone so new to the sport. That he posted a time of 6:22.5 for 21st place, 34 seconds behind the 5:48.2 score that Adam Neill delivered to defend his title, was therefore a disappointment to many, not least for Wiggins himself. Wiggins will improve as he adjusts to the demands of a new sport and sharpens his technique, but for this observer it demonstrates an important point. Rowing is hard. The major 2km milestones we set for ourselves on the ergo are, by their very nature, incredibly difficult to achieve and can only be done so through years of hard training. I speak from bitter experience. We should, therefore, not look at his performance from a narrow perspective as a personal failure. Rather it very effectively emphasizes the levels of endurance, power and technical discipline required in our sport. There is no fast-track to success, regardless of any previous sporting background. All rowers, young and old, can take comfort from that. Other highlights of the day included Graham Benton claiming another gold medal to add to his burgeoning collection as he took top spot in the 40-49 heavyweight category in a remarkable time of 5:55.7 – one of only 7 athletes to break the 6 minute barrier and the only non-GB squad rower to do so. On the women’s side Mortlake’s Kaila Engelsman was the Open category winner in 7:01.6, but the best time of the day was reserved for Imogen Magner who’s 6:56.0 took gold in the Under-23 category. 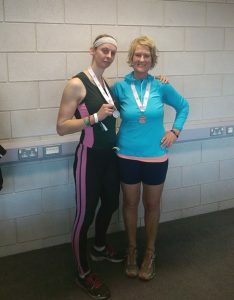 Nicola Lawless, runner-up to Magner, and Anna Muehle (30-39 heavyweight winner) were the only other female rowers to go below 7 minutes, in 6:58.2 and 6:57.3 respectively. Incredible performances by all. From a personal perspective the 2017 championships were bittersweet. As it turned out my BRIC preview blog post was an accurate prediction of the top 5 within my 40-49 heavyweight category as was my anticipation that I would find myself behind with 500 metres to go. I was indeed behind – some 60 metres behind – and while I was able to close the gap a little in the sprint to the line, Georgia Peramatzi’s winning time of 7:03.5 is beyond what I’m currently capable of. My time of 7:13.5 was faster than last year and good for a silver medal. Victoria Starr was once again on the podium taking bronze. While I was sad to lose my title, I was greatly heartened by the medal winning performances of my teammates from Auriol Kensington Rowing Club and Sub7 Indoor Rowing Club. It is their hard work and dedication that provides my motivation to compete, and to share in their triumph more than made up for any personal disappointment. I was especially proud of Diana Sargent, who I’ve been helping to train in the lead up to these championships, as she secured a bronze in her 55-59 heavyweight category. Diana is the first of many athletes I hope to train for this event. My ambition for 2018 will be to train a much larger group. This seems an appropriate place to conclude this blog, reflecting positively on a fantastic 2017 championships, and looking ahead to what next year may hold as the sport grows ever stronger and more popular. I’m incredibly excited to be able to play a small part of that. 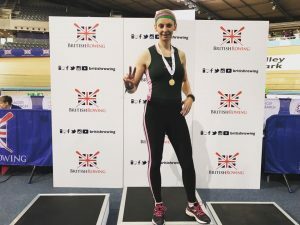 With the British Rowing Indoor Championships less than two weeks away (Saturday, 9th December) it was the obvious topic for my first blog post. 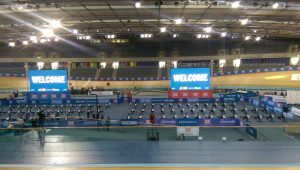 The 2016 Championships marked my first experience of indoor racing and it was an incredible event – held at the Lee Valley VeloPark, with a record entry of 1,900 competitors and a sell-out crowd. To their credit our sports national governing body, British Rowing, has thrown their weight fully behind indoor rowing in recent years and this event signified the full realisation of that project. That said the 2017 event promises to be even bigger, not least due to the entry of a certain Sir Bradley Wiggins. For my part I go into the 2017 Championships looking to defend the 40-49 Masters Heavyweight title I won last year. My strategy then had been to go out hard for 500 metres, get in front, and control the race from there. This played well into my hands as it’s the way I’ve always approached the 2km time trial on the ergo. The plan worked and I was delighted to win in a time of 7:14.3. In 2017 both of the women who stood beside me on the podium twelve months ago (Victoria Starr and Hannah Hawkins) are returning, along with the 2014/15 champion (Sally Pollok-Morris) and the current 1000m world record holder (Georgia Peramatzi). With such a talented field I’m well aware that I could find myself behind entering the closing stages of the race, but will stick to my tried and tested game-plan and will rely on my sprint finish to get back into medal contention. The stage is certainly set for an incredibly exciting race alongside some really fast athletes; athletes whom I have the utmost respect for. I really can’t wait. I’m not just at BRIC2017 to race. I’ll be vociferously supporting teammates from the two clubs I proudly represent, Auriol Kensington Rowing Club and Sub7 Indoor Rowing Club, and like everyone else very curious to see how Sir Brad stacks up against the elite rowers in the Open category. Naturally I’m also supporting the sport of indoor rowing. Given the amount of time and energy put into the sport by so many people it’s great to see it fully supported and going from strength to strength each year. Long may that continue. Are you competing at BRIC2017, coming to support or volunteer? I’d love to hear your aspirations and thoughts on the championships, and your views on the growth of indoor rowing as a sport in its own right. Please feel free to comment below. Jules760 on The 2k Ergo Test – Our Biggest Adversary? Red Star IRC on The 2k Ergo Test – Our Biggest Adversary? 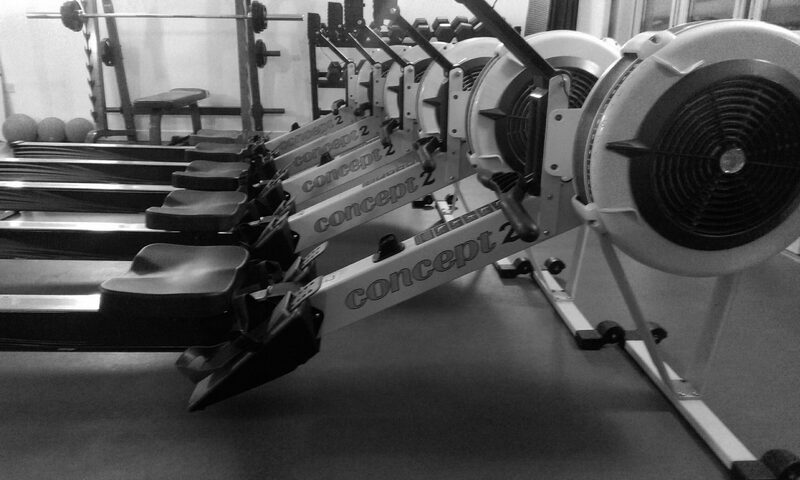 Marianna Raffaele on The 2k Ergo Test – Our Biggest Adversary?